By Jeff Aranow: Fighters and trainers had a mixed reaction in watching last Saturday night’s heavyweight title fight between WBC heavyweight champion Deontay Wilder and Tyson Fury at the Staples Center in Los Angeles, California. Like the boxing public, the fighters and trainers saw the outcome differently. There was very little agreement in picking the winner of the Wilder-Fury fight. The official outcome of the fight by the three judges was a 12 round split draw. The scores were 115-111 for Wilder, 114-112 for Fury, and 113-113. Most people agree that Fury (27-0-1, 19 KOs) was out-boxing Wilder with ease, and would have won the fight if he hadn’t gotten knocked down in rounds 9 and 12. Getting dropped twice was a bad look on Fury’s part, making it difficult for most of the fans to circle their wagons around him. Getting knocked down twice isn’t how a challenger beats a champion in this era of boxing. “It probably could’ve been a draw, but if it had to go to somebody I would say Fury,” said former IBF/WBC welterweight champion Andre Berto to Fighthub. It could have gone to Fury. He looked like he won more rounds than Wilder, but it appeared that Wilder won four rounds at least. With the two knockdowns, that makes it a draw. Wilder didn’t just win two rounds. To score it that way, you’d have to ignore rounds 1, 2, 3, 4 and 5. Wilder fought well enough to win all five of those rounds. Fury came on strong starting in the 6th round and appeared to win rounds 6, 7, 8, 10 and 11. Fury took too many heavy shots in the first five rounds, and then he was knocked down in the 9th and 12th. “I think Wilder should’ve won the fight because of the two knockdowns,” said IBF/WBA junior middleweight champion Jarrett Hurd to Fighthub. “It was a close fight. Wilder should’ve won that fight. I think Wilder’s going to learn from it if they do a rematch, just like he did with [Bermane] Stiverne,” Hurd said. It’s possible Wilder will improve and make adjustments for the rematch with Fury if there is one. Wilder seemed to have figured Fury out by the last quarter of the fight. Wilder realized that the only he was going to beat Fury is to load up on every shot, and be willing to miss a lot. 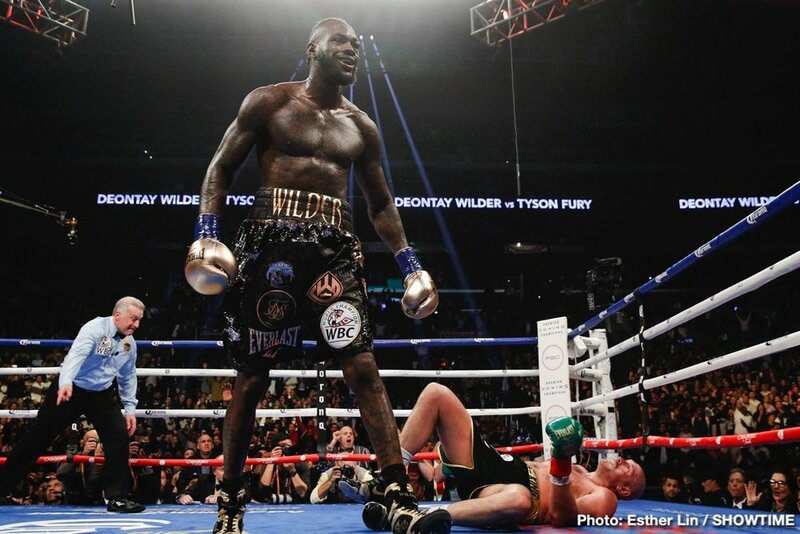 Wilder had been missing throughout the fight, but he was tentative in the first eight rounds and not taking power off his shots in order to connect. Wilder was making the same mistake former IBF/IBO/WBA/WBO heavywight champion Wladimir Klitschko made against Fury in November 2015. Wilder getting those two knockdowns in the second half of the fight was the thing that made it difficult to give the fight to Fury. When a challenger gets knocked down twice, they end up losing most of the time. The fact that the judges gave Fury a draw is a compliment to him. Most of the time the judges don’t give a challenger a draw when he’s fighting in a foreign country and he’s been knocked down twice by a world champion. Fury, 30, might have been given a break due to his popularity and the fact that he’s a former unified champion. You can argue that it’s very rare though that a challenger can get a draw in foreign country when they’ve been knocked down twice by a world champion. Fury got a draw against Wilder, but he could have easily been given a loss if he wasn’t a popular fighter. That’s how boxing is.